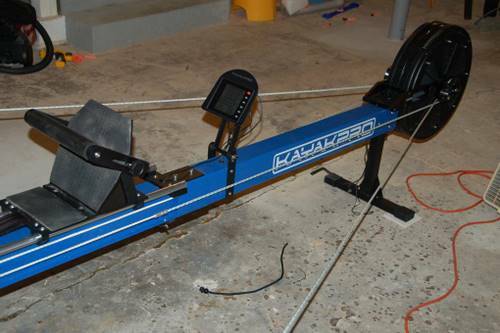 A year ago, Kayakpro released an updated version of their Speedstroke kayak ergometer. 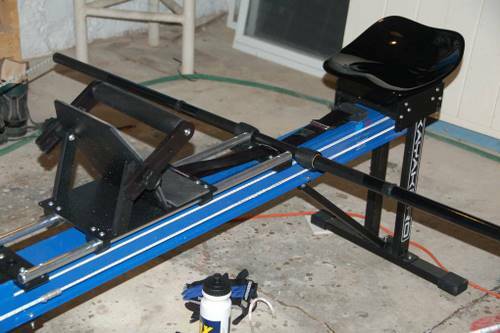 In an effort to be on the leading edge of the indoor paddling world, I made the switch from their older model, the Speedstroke which was introduced in 2001, to their newer model, the GYM, one year ago. KayakPro is owned and operated by British ex-Olympian and World Champion Grayson Bourne. The main frame of the GYM is a combination of aluminum and steel. 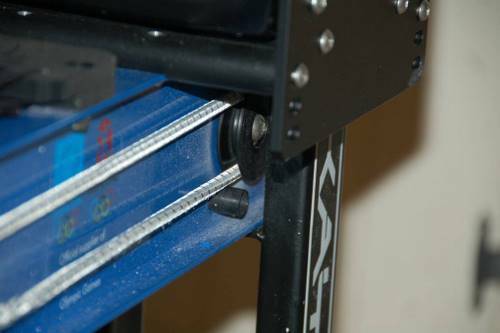 There are two main sections to the horizontal frame with one fitting inside the other one and secured with hard anodized aluminum plates and allen bolts. The front and rear supports give it a wide base of support. The seat shape is wider and flatter than most K1 seats and should fit most paddlers well. The seat is mounted on hard anodized aluminum plates which attach to the frame and allow for three different seat heights. The lowest of these is a close approximation to most racing surfskis on the market today. The footplate is full and angled forwards slightly like most surfskis. The pull bar is padded, adjustable, and solid. 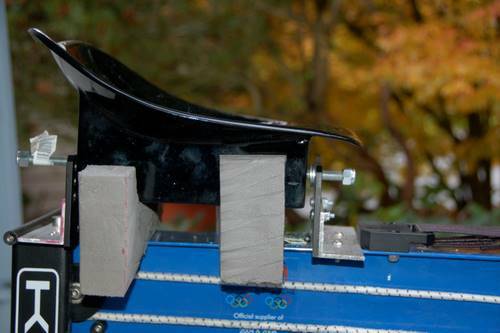 Footplate position is micro-adjustable via a nylon belt. The fan/flywheel is housed in aluminum. I did not take this apart to examine the interior. The shaft is a 3-piece coated aluminum shaft with a middle male piece and outside female pieces that all screw together with standard type barrel screw adjusters. The GYM is 114” long ( about 10 inches longer than the Speedstroke). The space required is somewhat dependent on the size of the paddler, but it will need about 64” of width and about 72” of ceiling height. It weighs about 50 lbs. The GYM doesn’t fold or stuff into a closet, but it doesn't take up too much floor space if it is pushed against a wall while not in use. Resistance on the GYM is adjustable and the amount of resistance can be accurately measured. Here is how it works: On the fan/flywheel is a lever that toggles from 0 to 9. Zero gives the least resistance and 9 gives the most. The paddler selects a level and paddles for a few seconds to get the fan/flywheel to reach a speed of greater than 700 revolutions per minute. Once a speed of over 700 is displayed on the monitor, the paddler stops paddling and lets the fan/flywheel coast to a stop. 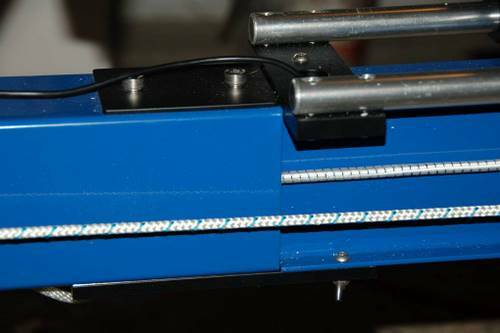 Sensors monitor the rate of fan/flywheel deceleration at up to 100 times per second. 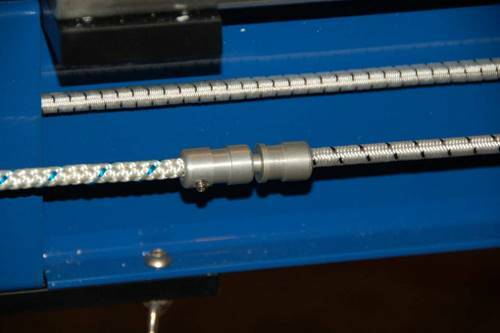 The amount of resistance detected is displayed in the stroke rate box as a number. 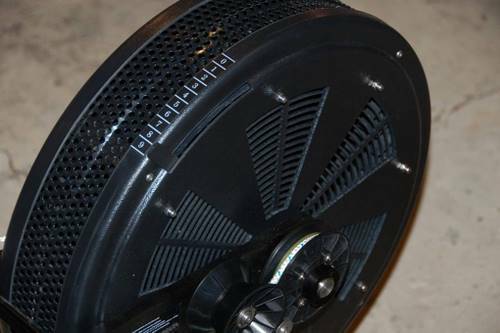 Since the fan/flywheel pushes air, and since air density changes with both altitude, temperature, and barometric pressure, one can get an accurate measure of their GYM's resistance so that they can accurately compare workload (time over a distance) against another paddler on another GYM, or get an accurate comparison of your own workload at two different points in time. The GYM’s frame houses a stretched out bungee cord that runs an exhausting course from the fan/flywheel pulleys to the rear support legs, to the front support legs, to the mid frame underneath the computer monitor, back to the front support legs, back to the rear support legs, and then to the rope pulleys on the other side of the fan/flywheel. For a kayak ergometer to be effective as an on-water simulation, it needs to engage the resistance immediately as the top hand starts to drop down and back, and this can only be accomplished if the fan / flywheel pulleys are located far in front of the paddler and not too low. This design will cause the paddle ropes to be close to horizontal throughout the stroke allowing for an immediate "catch" once the top arm transitions from moving forwards and across to moving down and back. On shorter kayak ergometers, the first third of the stroke is seriously compromised because the top arm must drop down and back too far before the ropes start spinning the resistance wheel. The buttons on the monitor aren't labeled in familiar abbreviations. But, the computer monitor is actually very simple to understand and use - unlike many gps units and bike computers. There are five number sets simultaneously displayed. On the top line is “meters to go” which is set by the paddler. 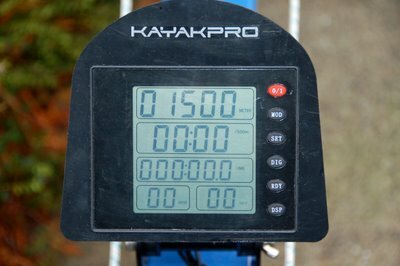 The second row gives either “pace per 500 meters” / kcal burned / or watts, and the paddler can decide which one to view. I initially found this number difficult to work with as I usually view current speed on the gps when outdoors. However, one adapts to this new number fairly quickly. The third row shows elapsed time. The time begins once the flywheel starts turning and then runs continuously until the "meters to go" gets to zero. The lower left display shows the stroke rate, and the lower right display shows your current heart rate. Already in use is a software product named i-race Express that allows multiple GYMs in the same room to connect and race against one another on a laned regatta type course with the ability to see the race animated on a screen. This software was used at last year's British, French, and US indoor kayak championships and allowed both athletes and spectators to view the virtual races on computer screens. In the works are updated versions of the i-race Express software as well as the Virtua-race software which allow for online racing and online group training sessions. The Virtua-race gives the user a first or third person view of a 3D course to paddle through. Both of these software products are PC based and require connecting your GYM to your PC which is easy to do. User options for the i-race Express and the Virtua-race include racing head to head with up to 31 other boats online, racing other computer controlled boats that have a programmable pace, or simply time-trialing solo on a course that gives you a picture to look at as well as the basic numeric data. Another software product available called E Monitor Pro 2 displays and records the following parameters: Distance, Stroke number, Stroke rate, Stroke length, Heart rate, Speed, Watts, Ave Watts, Drag, and Graphic Power curves for left and right sides. According to Grayson Bourne, K1 sprinters are utilizing the E Monitor Pro 2 software to design the race plan that works best for their physiology. For example, a paddler can get a power curve their cumulative strokes in a 500 or a 1000, find out exactly when power starts to drop, institute changes to their power output, and see improved times - all with a repeatable, accurate, ergometer test. So what is it like to use? How hard can it be? The paddling position is about right. Both surfski paddlers and higher seat K1 paddlers will be able to simulate their on-water paddling positons pretty closely with the paddlers feet lower than their seat. Paddling with the lever at setting “9”, feels pretty similar to paddling a K1 or ski with a bungee around the hull. Setting 7 or 8 feels about like a real ski, and paddling at setting “0” feels about like you’re paddling on a double’s wake at moderate speed. How hard can it be? The day after I put the GYM together, I tried level 9 with a 68" (too long!) shaft, and attempted some intervals to see what ol’ “Doc Hudson” could do. My first time trial attempt was 5 km which should have taken about 22 minutes. I made it about 12 minutes into it when I absolutely exploded. If you had made a cartoon out of that attempt, you would have drawn a mushroom cloud wafting up on that frame. Ok, Fail #1 which was a bit tough on the ego. I next tried a shorter 1500 meter time trial with the same settings. I figured that this one would be easier, after all, how hard can it be to paddle hard for 6 minutes? But, just to be safe, I went upstairs and told my wife that if she heard a “thud” sound, you know, like a body flopping onto a concrete floor, then she might come check on me - at her convenience, of course. I think that I got to about minute 4 before I almost fell off the machine from hypoxia. Mushroom cloud #2. Zero for two. That left me with the 500 meter event. I can hold my breath for two minutes, so how hard could a 500 be? I set off on a 1 min 40 pace for the first minute - and mushroom cloud #3 floated up at about 1 min 30 seconds. Such was my introduction to the GYM. I've since learned how to interpret my effort in "pace per 500 m". 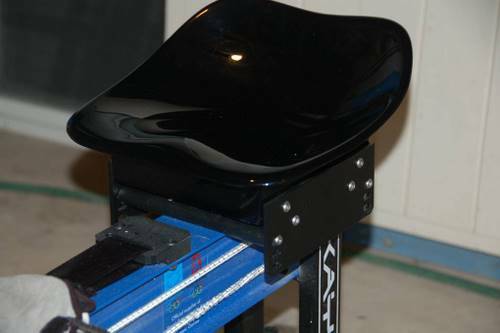 Reasons for owning a kayak ergometer. 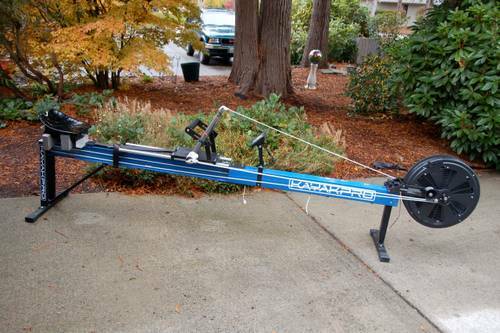 Even paddlers that have access to water year 'round can still benefit from owning a kayak ergometer. If you are an 8-5 rat like me, then for several months each year if you live at a higher latitude, you might face darkness or cold during your morning or evening training sessions - that is if the water is not iced over. While paddling in those elements is an option, it is safer, and more convenient to sit on a kayak ergometer. Plus, the more efficient use of your time will likely keep your spouse and kids happier. The GYM is exceptionally robust. I think that this GYM will outlast me. The only question will be which one of my children will inherit it. Excellent simulation of the kayak stroke technique. One can honestly develop proper technique on this ergometer. The rope pulley system is exceptionally smooth. The catch is immediate and solid. Paddling on the GYM feels very close to paddling on water. Computer - Having so much data on a compact display is great. I also like that because of the ability to calibrate the computer monitor, I can accurately measure how much power I can produce today, mid season, next year, and next decade independent of the boat and the weather. Cost. While the cost seems rather high for what might be thought of as off-season supplementary training equipment, the price is competitive with other proper full-feature kayak ergometers on the market. The GYM should outlast most all skis, too, if they are used regularly. From my past experience with Kayak ergometers, you sort of get what you pay for. The shaft just doesn’t feel as nice on the bare hands as carbon does. It also is weighted towards the center as opposed to at the ends like a real paddle. But, the diameter is right, the adjustability is useful, and a replacement all carbon ZRE shaft is always an option for the persnickety folks. It's too stable compared to a real boat, but this is true of rowing ergometers and bike ergometers, too. I think that some sort of instability built into the seat might be a nice option. Over the past decade, I have owned and/or tried four other kayak ergometers, and the GYM is hands-down the best one as a stand alone unit. Add in the availability of software and the accurate calibration, and the GYM encourages a kayak ergometer community not unlike the Concept rowing community.